As a teenager. I was a bit of a rebel trying very hard to express myself and eventually through photography I found myself. Roversi, Sarah Moon, Richard Avedon, Tina Modotti, Edward Weston, Man Ray, Henry Cartier- Bresson, ... and films .. Fellini, Orson Welles, Antonioni, Alfred Hitchcock, David Lynch, Tim Burton. I discovered your work via Instagram. Your women portrait series is terrific and the pictures are very strong! How did the idea come up to start a project about Women? I was working in Milan and just met with two talented ladies Claudia Nesi and Daniela d’Ortenzi, style and make up @ Pervinka. They had an interesting background working with fashion designer Romeo Gigli and we immediately clicked. We decided to create a series of portraits of women that went beyond fashion. Strong women, interesting and talented women with a definite style. Some of the images look like Frida Kahlo, Marlene Dietrich and Audrey Hepburn. Is there a connection? 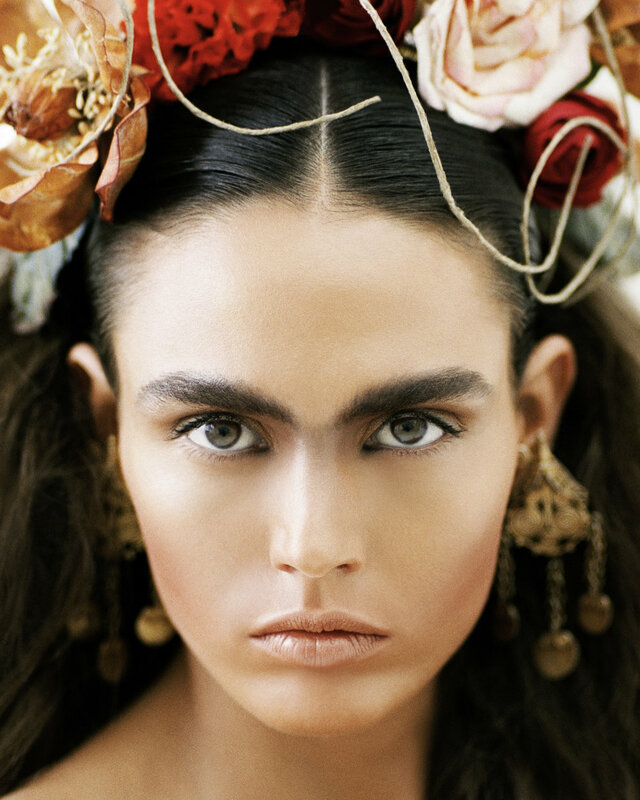 We wanted to take inspiration from the past, from Art, History and Culture but we wanted to recreate a modern version of these characters: Tina Modotti, Frida Kahlo, Elisabeth I, Tamara de Lempicka and the Marchesa Casati all have a definite style and they are strong, independent and talented women. Do you have a certain workflow when you start a project like this? I then decided to take it further and create art pieces for each individual portrait in collaboration with Italian graphic designer Spire. The art project was very well received and took us to various exhibitions in Italy and in London. The art pieces are now on sale online at Saatchi Art, Fine Art America, Rise Art and LumiArts. In 2008 you won a collaboration with D della Repubblica in Milan and worked with fashion designer Romeo Gigli. Had this collaboration have an influence in your photography? Absolutely. D della Repubblica gave me the opportunity of getting published and make myself known. Romeo Gigli is such a great talent, a true artist. He and his team believed in me and he gave me the freedom to interpret his new collection. How important is it to hear your inner voice as a photographer? Very important. I always try to listen to it and follow my instinct. You work as a full-time photographer. What advice would you give young female photographers who are starting to become a photographer? To be flexible and diversify within the industry; never stop shooting personal projects; network! Final question. Is there any female photographer you admire? Sarah Moon, Tina Modotti, Diane Arbus, Mary Ellen Mark, Cindy Sherman, ..